Big block surprise. 600 cars, and Bubba, and Katy Perry. Speechless. 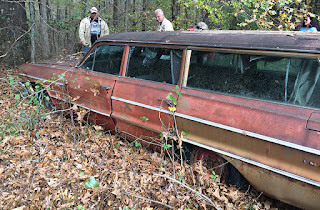 It was almost Thanksgiving and I found myself staring at a 1964 Chevrolet Impala wagon with a 409 engine in a field full of classic cars near Oxford, Mississippi. So much to see, but this car stopped me in my tracks. Bubba and his wife, Allyson, (a genuine Katy Perry look-alike), emailed an invite to the Junkyard Life crew to come and visit their vast backwoods car collection. 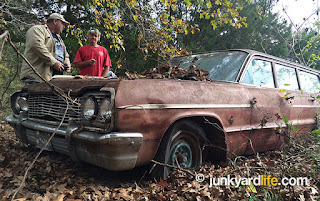 They even encouraged us to drag along a tow dolly, in case we saw some rusty gold that we might want to buy. 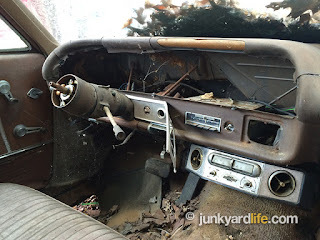 Finding only one derelict dream car among hundreds was the problem. After a first-class tour and four-hour junkyard hike, the 409 Impala wagon was at the top of my tow-worthy list. 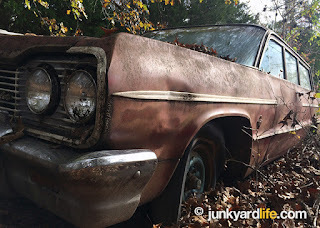 An original 409 Impala with pure patina, and it’s a wagon! Let’s take a closer look. Mississippi car collector has 600 cars scattered across his property, among them a 409-equipped 1964 Impala wagon. 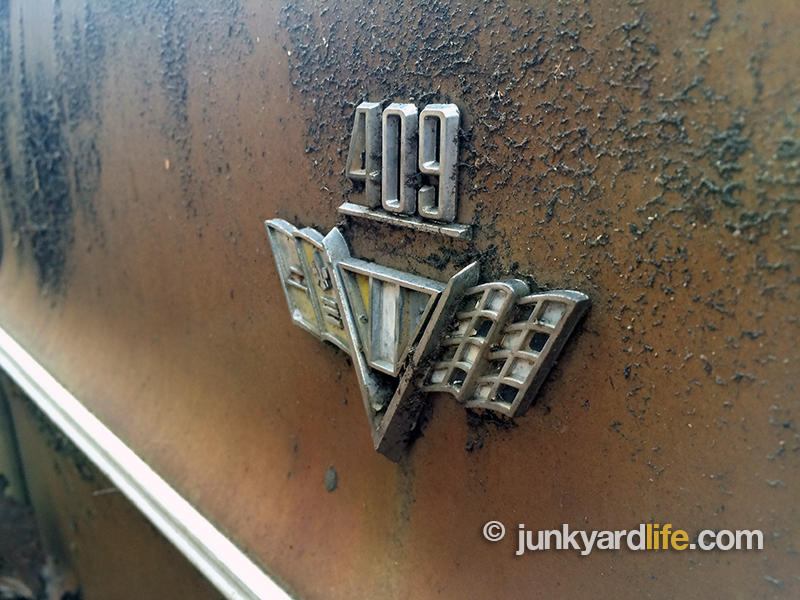 The tour came to a halt when the 409 emblems were spotted. 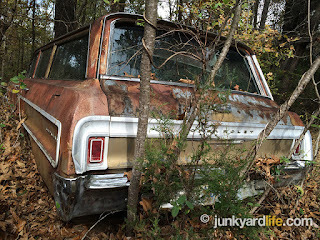 At first glance, it just looked like a cool, old wagon from the X-frame era of GM’s full-size chassis. 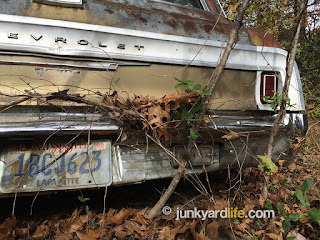 Decades of life out in the elements left few traces of metallic Fawn paint clinging to the flanks of the long roof ’64 Chevy. I asked Bubba for permission to lift the hood to see what we hoped was the big block W-engine. 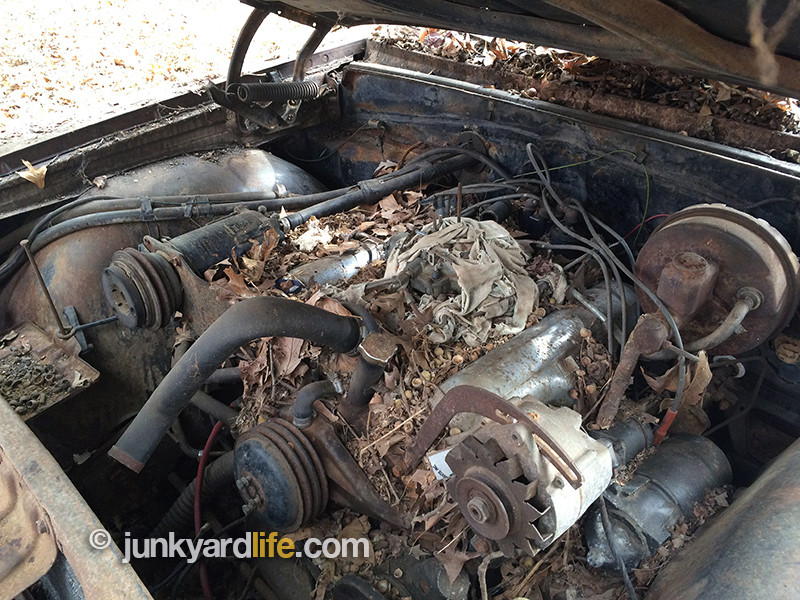 Despite junkyard dreaming, we didn’t expect to see the original 340hp 409 engine under the hood. Who would believe us? Sitting in a field is an original 409 Impala 4-door wagon with the drive train intact. Chevy 409 engines are seldom seen at car shows, or cruise-ins, and never seen during our typical junkyard adventuring. This is the base L-33 340hp 409 engine that was equipped on all automatics. This ’64 Impala was special ordered as a service vehicle. 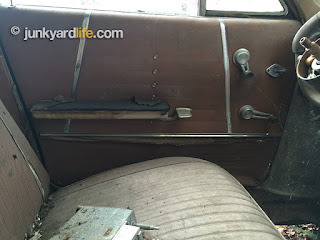 No rear seat. Perhaps a funeral home looking to boogie down with the Beach Boys ‘409’ song? 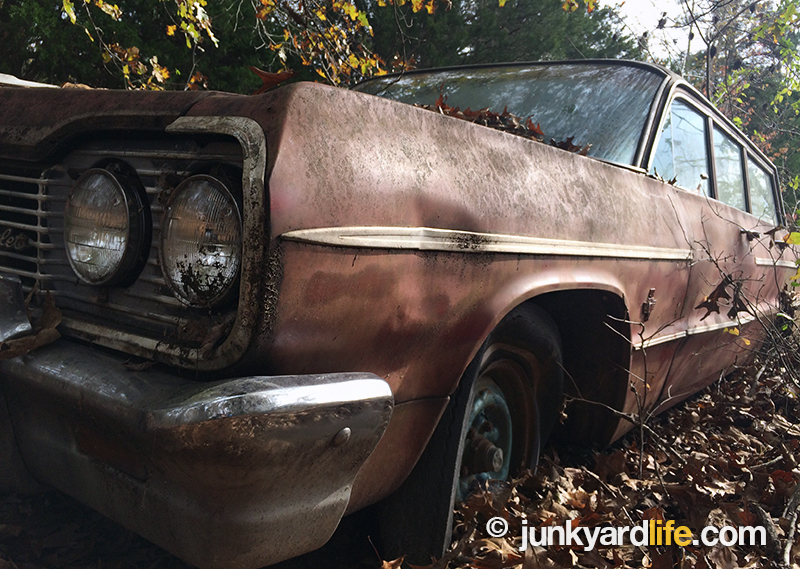 Despite the decades of neglect and a few parts stolen by a local parts thief, the 409 wagon begs for a restoration. 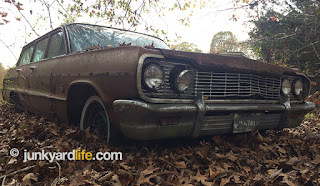 Bubba thinks the car had less than 100,000 miles on it when he bought it. 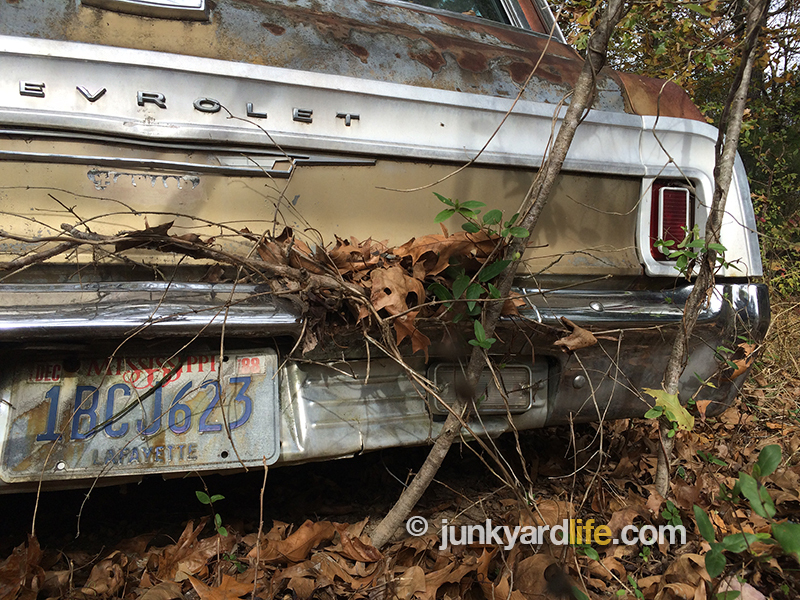 The tag on the rear bumper was registered in 1988. 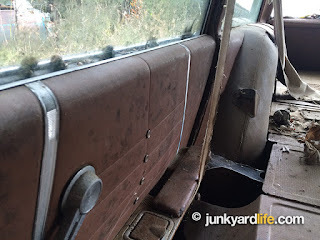 Some 409 Chevy wagons were factory-equipped with a 7,000 RPM Sun tach above the steering column. 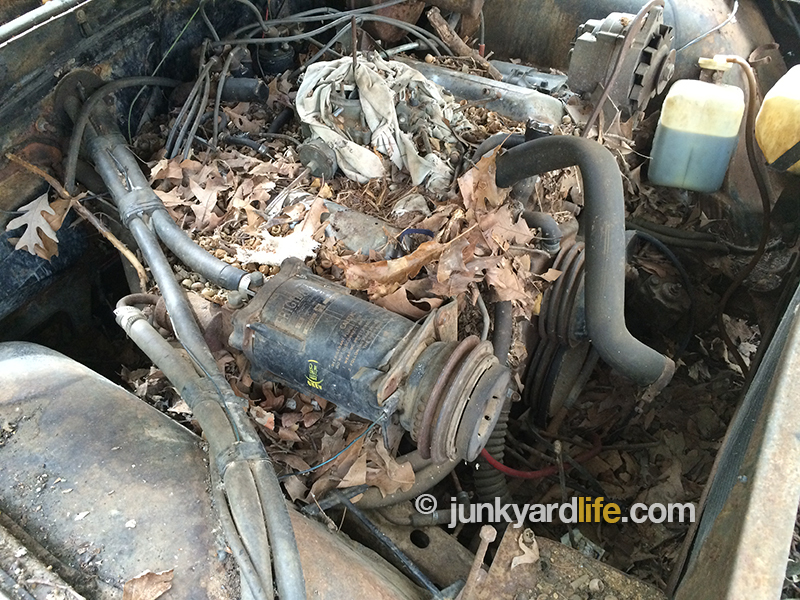 All 1964 409 engines with automatic transmissions (Powerglide) were 340hp engines (L33). Original interior remains on seats of the 1964 Impala 409 wagon. 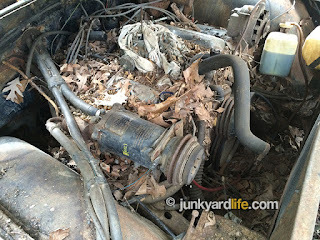 Junkyard Life brother, Keith Lively, and Bubba talk big block 409 horsepower. Trying to work out a deal with a guy who has collected hundreds of classic cars is no easy task. 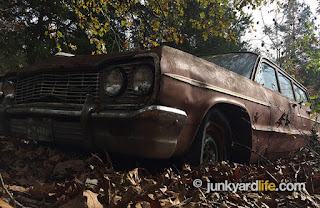 I tried bundling another ’64 SS Impala that he owned into a deal. The SS had a better body and interior, plus Bubba only wanted the SS for its drive train. Those negotiations never got off the ground. The trailer came home empty. 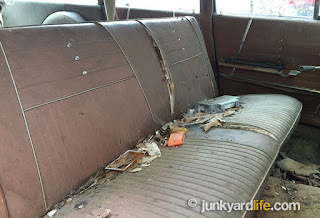 We enjoyed the trip and found too many dream car projects to count. 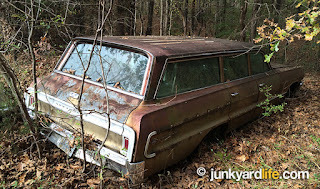 Maybe, next time the sleeper station wagon 409 comes home with me? Or the Road Runner, or the ’56 Ford, or the AMC Rebel, or the ’Cuda, or the GTO... ? Distinctive 1964 Chevrolet grill has taken its fair share of abuse. 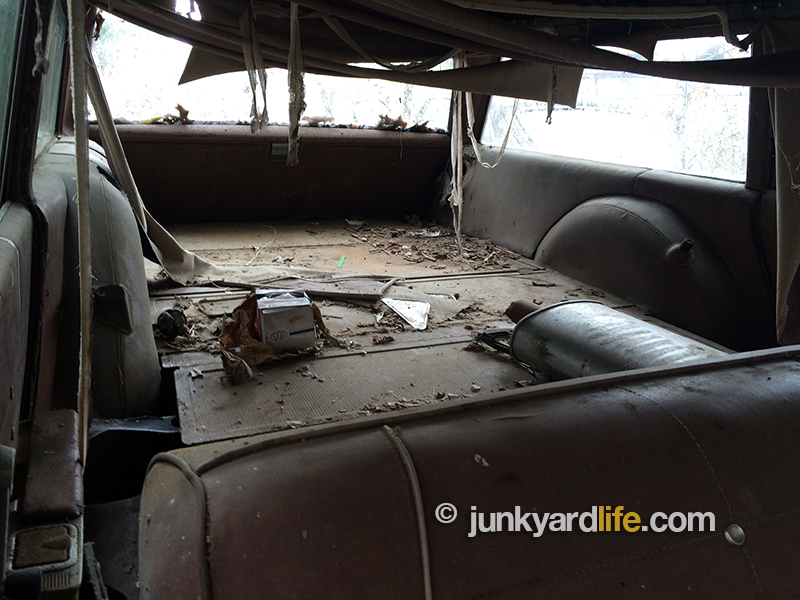 Cargo area of the 1964 Impala wagon is huge. Imagine a funeral home using a 409 wagon to haul you to the Heavenly Gates. 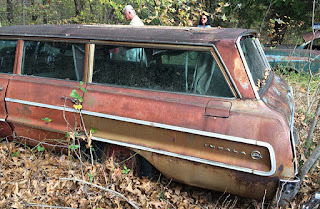 1964 Impala wagon. Long roof, long car. Great lines. Rear door panel on 1964 Impala 409 wagon. Wheels sink into the earth on the 409 wagon. Like a ship out to sea. 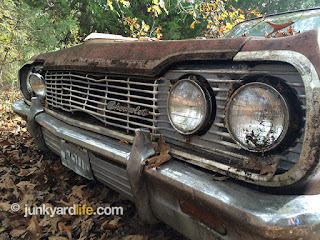 The 409 wagon has weathered many storms. Fawn paint clings to the 1964 Impala wagon quarter panel. All glass is intact on the 1964 Impala wagon. Tag from 1988 hangs on rear bumper of the 1964 Impala wagon 409. 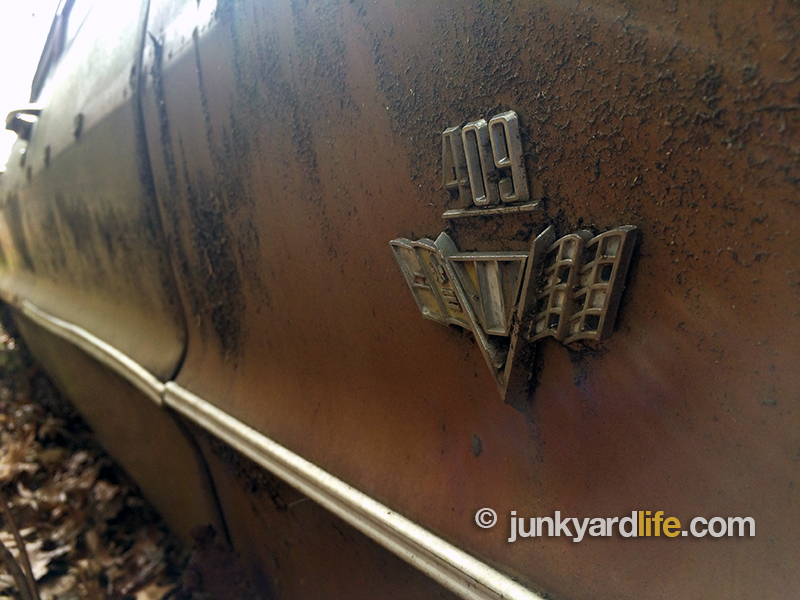 Trees push against the bumper of the 409 wagon. My first sighting of 409 emblems in the wild. The original chrome air cleaner is missing from the 409 engine. High compression, solid lifter variations of the 409 engine produced as much as 425hp. She’s real fine, my 409. Nothing can touch her but time. 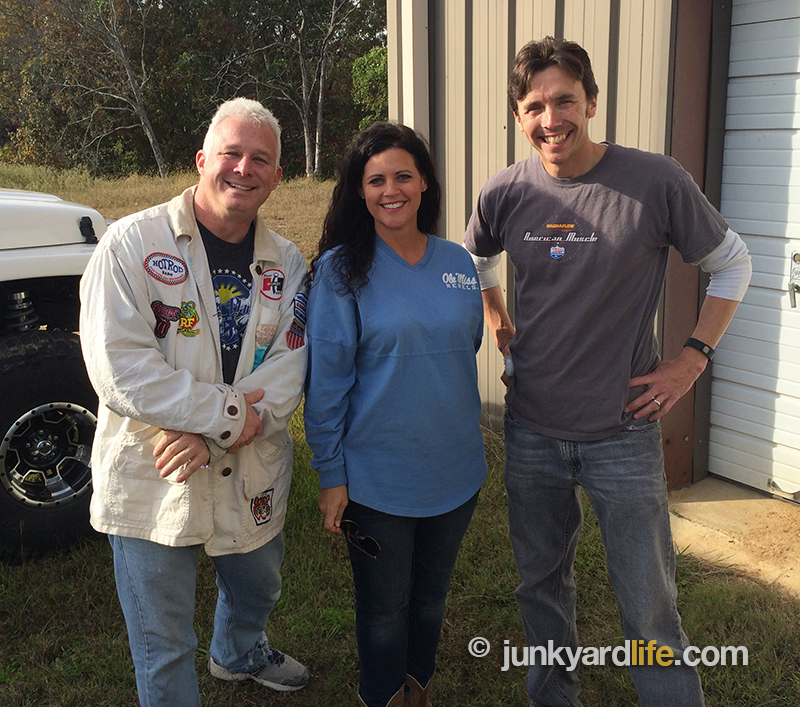 Special thanks to Bubba and Allyson, for showing us around their fantastic car collection. She’s a Katy Perry look-alike, am I right?